Hey everyone! I hope you're having an awesome Thursday. I have some very cool news to share. 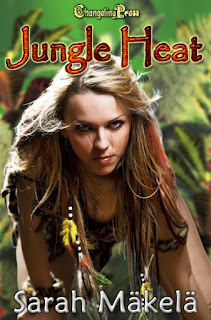 First of all... wow, Jungle Heat is up for Preditors & Editor's Readers' Poll for Romance Short Story in 2011! I'd love your vote! I'm also excited to share that Techno Crazed, the first book in the Hacked Investigations series, is now available for Nook at Barnes & Noble! Get your copy here. Also, I have the tagline and blurb for my February 2012 release, Captive Moonlight, part of the Wolves of the Wild West multi-author series, but can be read as a standalone. The tagline and blurb might still change a little, but I figured I'd give all you a sneak peek! Tagline: A gentlewoman will do whatever it takes to rescue her captive werewolf betrothed. Blurb: When her betrothed, Joe, is taken captive by a group of men looking for werewolf laborers, it's up to Charlotte to track him down and win him back. Pretty simple, but I think it sums the story up well. I can't wait to see the cover, and I'll definitely share when I get it! Awww! Thank you, Lisa!!! :-) I really appreciate it!